Pityriasis rosea is possibly due to a viral etiology. The rash lasts 8-12 weeks. It is mildly itchy. It is benign and not contagious. Girzadas comment: You have to let patients know that the rash will be around for 2-3 months. Steven Johnson disease is a dermatologic emergency with 5% mortality. Patients have bullae, skin blistering, and mucosal lesions. Elise comments: The diagnosis is TEN if more than 30% of body surface area is involved. The diagnosis is SJS if less than 30% of body surface is involved. You have to examine the eyes. This disease can severely damage the eyes via conjunctival erosion. Erythema nodosum is associated with strep infections, TB, and autoimmune diseases. Stage 2 Lyme disease is associated with heart block. 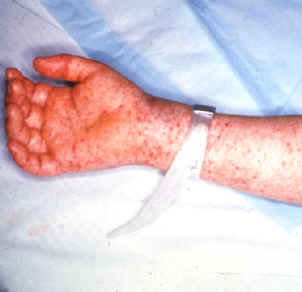 *Rocky mountain spotted fever rash. Fever can precede rash by a few days. Patients will have headache, nausea and vomiting. Scombroid poisoning: Results from histidine on the dark meat of fish. The histidine gets converted to histamine and causes an allergic type reaction. Fish in the Scombridae family (tuna, mackerel, skipjack, and bonito) are the most common sources of illness. Other fish, such as mahi mahi, bluefish, marlin, and escolar can also cause scombroid fish poisoning. *Janeway lesions are associated with acute endocarditis. *Silver inhalation or ingestion can cause bluish-grey discoloration of skin. People who use silver preparations as homeopathy can get this discoloration. The skin color change is permanent but does not cause any health problem. *Disseminated ghonorrhea. These lesions do not contain bacteria. You have to culture the cervix or urethra or throat to definitively identify the organism. CO toxicity is the most common cause of toxicologic morbidity and mortality. The cherry red skin is uncommon. Elise comment: Especially in the winter when people have their furnaces running, think about CO poisoning in patients with headaches, patients with nausea and vomiting, and any time two or more family members come to the ED with GI Flu-type symptoms. Treatment for tinea capitus is griseofulvin for a few weeks. Topical antifungals don’t work for tinea capitus. Griseofulvin has some hepatotoxicity, but you don’t need to check LFT’s in healthy kids prior to starting treatment. Kerion is a more severe version of tinea capitus that is a boggy scalp mass. It also has hair loss. Don’t incise and drain it. Treat with oral griseofulvin. Many medications can cause pancreatitis including ace inhibitors and valproic acid. In 1% of patients over 40, pancreatitits can be caused by pancreatic cancer. If patients present with pain for 4 days or more, the amylase may have returned to normal. The lipase remains elevated a few days longer than the amylase. Dr. Berkelhammer felt that there was no need to order an amylase in addition to a lipase. He felt amylase just confuses the diagnosis. Just get a lipase. Most pancreatitis is classified as mild with no organ dysfunction. Patients improve in one week. You don’t need a CT scan in mild pancreatitis. Moderate pancreatitis has transient organ failure, exacerbation of comorbid conditions, or pseudocyst/necrosis. Pancreatitis is classified as severe if the patient has more than 48 hours of organ failure. This can include renal failure, respiratory failure, hypotension or other organ failure. High LDH may be an early marker of pancreatic necrosis. CT is indicated only for moderate and severe pancreatitis, or if there is a differential diagnosis that needs to be ruled out like perforated ulcer, or cancer. Girzadas comment: We won’t know by looking at the patient if they have local complication such as pseudocyst or necrosis. So it sound like we should get a scan if the patient has lab evidence of organ dysfunction, has respiratory failure or has hypotension. Berkelhammer response: That’s correct. An IV contrast CT is preferred if the patient’s renal function is normal. If the patient has a low GFR, a plain scan will also give useful information. The choice of whether to use IV contrast or not depends only on the renal function. IV contrast is not damaging to the pancreas. Management: IV fluid bolus followed by maintenance rate of 5 ml/kg/hour for the first 8 hours. Back off the fluids after the first 24 hours. Lactated ringers is preferred over normal saline. Dilaudid is preferred over morphine due to less ampulla of vater constriction. Antibiotics are no longer recommended for pancreatitis unless there are signs of sepsis or cholangitis. Antibiotics have been shown to increase the risk of fungal or other resistant infections. Antibiotics should be given if you have concerns for cholangitis or patients have signs of ductal dilatation on ultrasound and elevated liver enzymes/bilirubin. ERCP is indicated for cholangitis. Cholecystectomy is indicated 3-5 days after mild gallstone pancreatitis. If pancreatitis is moderate or severe, cholecystectomy is delayed until pancreatitis is resolved. Response to Sam Lam’s comments: The level of lipase does not predict severity of pancreatitis. It is not the BNP of the pancreas. Sometimes if the serum lipids are very high, the lab cannot run the lipase. In this situation, you just have to make a clinical diagnosis of pancreatitis and wait for the hyperlipidemia to resolve. Case 1. 56yo male actively seizing. Patient was an emaciated alcoholic patient. Patient received high dose benzodiazepines and was rapid sequence intubated. Patient received IV keppra. After intubation, a blood sugar was checked and blood sugar was 20. IV glucose was then given. Patient then developed torsades while in the ED. He was given IV magnesium and IV amiodarone. Torsades resolved with that treatment. Teaching point was to check blood sugar immediately in a patient that is altered. The patient was a malnourished alcoholic who was prone to hypoglycemia and hypomagnesemia. Andrea comment: Think about the Dexi as a vital sign. Elise comment: Think about the general description of the patient. Emaciated alcoholic is at risk for hypoglycemia and hypomagnesemia. I would also scan his head to evaluate for trauma. Be sure you know your platelet count and coags prior to performing LP. Case2. 82 yo male brought in by son for constipation. Patient has dementia. Vital signs are normal. Labs show no specific cause of pain. Son seems perturbed that the work up is taking more time than he would like. X-ray showed sigmoid volvulous. Patient is taken for surgical decompression. Case3. 65 yo male with eye redness. Patient has history of rheumatoid arthritis and prior surgery for glaucoma. Patient receives Humira for rheumatoid arthritis. Patient has HR=102, BP=102/55, T=37.8C. Eye exam shows hypopion. Diagnosis was enophthalmitis. You need to start IV antibiotics. Vanco and Gent are reasonable. Consider IV anti-fungals as well. 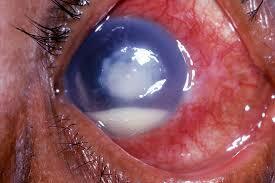 Then consult ophthomology to emergently give intra-vitreal antibiotics. Elderly male presents with abdominal pain. Patient is in moderate distress due to pain. Cardiac exam was irregularly irregular and tachycardic. EKG shows Afib with RVR. Abdominal exam had pain out of proportion to exam. Patient had a large inguinal hernia. Initial differential diagnosis included mesenteric ischemia, incarcerated hernia, and testicular torsion. Labs show Lipase of 700 and Lactate is 8. CT is delayed due crowding. Patient goes for testicular ultrasound first. Patient becomes more agitated in ultrasound making CT difficult and patient is sent back to ED for more pain medication prior to CT. Patient received IV dilaudid and IV ativan. Patient then becomes somnolent and hypotensive. He receives full dose IV narcan that brings the patient back to an agitated state. Still no CT scan done yet and patient is more agitated from pain. Eventually pain control is opbtained and work up/CT gets done. CT shows pneumperitoneum and perforated bowel. Patient was intubated. Post intubation CXR shows right mainstem intubation. You have get the patient to CT in a reasonable time frame. The physician needs to stay on top of this and follow up with the charge nurse to be sure it is getting done. Cautiously titrate opioid pain medication and benzos in elderly patients to avoid respiratory depression and hypotension. In the same way, don’t give full dose narcan to reverse over-sedation. Tritrate the narcan to the point where the patient is responsive and not hypotensive. Check your post-intubation CXR as soon as it is done to be sure of your ET tube position. 60% of all workplace violence occurs in healthcare and social service settings. A study at Henry Ford identified multiple handguns and knives in the possession of ED patients. Trauma patients in the ED may be altered from drugs/alcohol or have a brain injury that could affect their judgment. Keep a safe distance from patients. Keep the door of the exam room open. Stay between the patient and the door so your exit is never blocked. Keep your belongings out of the patient’s reach. Have a plan of how to get help if you need it. Trust your gut if you think the patient is showing signs of agitation or potential violence. Clues to violent behavior: loud speech, pacing, restlessness, suspicious, threatening remarks, responding to internal stimuli, under the influence of drugs or etoh, delirium or psychosis. Keep your team safe: Stay calm and speak calmly with the patient, be alert to signs of impending aggression (noted above), don’t threaten the patient or make demands, genuinely listen to the patient when they speak, try to align the interests of the patient and the medical team, decrease stimuli such as noise and light, give the patient some options like oral benzo’s or food. Girzadas comment: Studies have shown that food is very effective at lowering the level of agitation/anger. Remke comment: Use your security guards to accompany you when going into potentially difficult/dangerous situations. Lam comment: Make an assessment of the patient’s eyes. If they are looking at you intensely it may be a sign of impending violence.